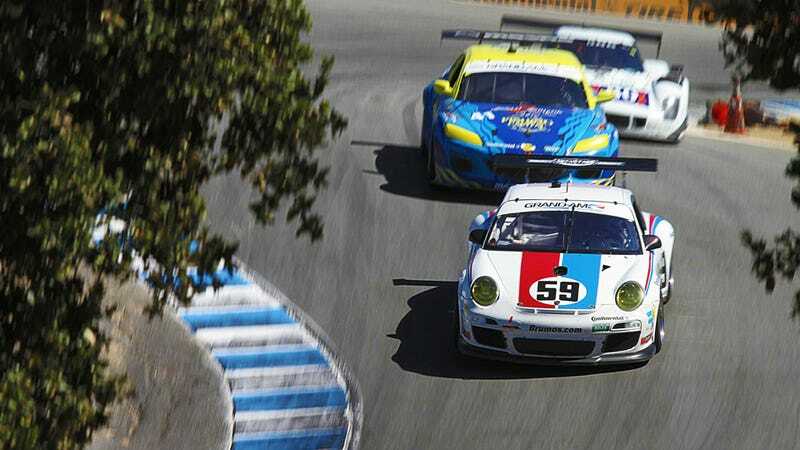 GT cars and Daytona Prototypes descended on the Best Coast's standout track, Laguna Seca. Prepare yourself for some wholly gratuitous Corkscrew action. The star of the day was the track, which is always awesome to watch. Hell, go watch some random Group C-era IMSA races and you'll still have a good time. The #90 Corvette DP got pole and won, though it didn't lead the whole race. It went back and forth with the Spirit of Daytona ‘Vette and the Starworks Riley/Ford. That #99 Spirit of Daytona car was really hoping to win, what with the race being the 99th the team had entered and it was on 9/9. They banked on a caution, though, and had to pit for fuel a few laps from the finish, knocking them to second. Down in the GT class, the tube-framed RX-8 of Team Sahlen got its first victory, certainly pleasing some Mazda execs. We care more about how the rotary-engined car spits flames like it's in the circus. Trevor Andrusko and Halston Pitman were there for MotorSportMedia and got an awesome collection of shots, along with some onboard footage from the #31 GT Corvette with Eric Curran at the wheel. Go through the full gallery and don't forget to click "expand" in the lower right to get all of these pictures in wallpaper size.